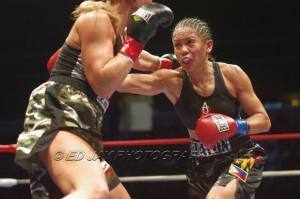 VIDEO: ANA JULATON WINS WBO SUPERBANTAM TITLE!! In a very entertaining fight last night Bay Area female fighting Pride of the Philippines World Champion Ana "The Hurricane" Julaton won her 2nd World Championship making boxing History to become the 1st ever WBO 122lbs World Champion! Ana fought a very technical, nonstop punching action gameplan connecting with heavy blows and fast combinations. Showcasing her revamped strength and conditioning courtesy of Coach Lauro Doroliat Ana showed she has gotten stronger wobbling Biggers a few times with assaults to the body and head. Her Chief Trainer really worked on accuracy of punching and defense and it showed through out the entire ten round battle as Julaton dominated winning 100-90, 99-91, 99-91 and cutting Donna Biggers on both sides above the eye with her wicked Jabs which right now is arguably the best jab technique in the female fight game. Now the IBA and WBO 2 time World Champion Ana is looking to unify the World Championships at 122lbs.